For other uses, see Oshkosh. Location of Oshkosh in Winnebago County, Wisconsin. Oshkosh was named for Menominee Chief Oshkosh, whose name meant "claw" (cf. Ojibwe oshkanzh, "the claw"). Although the fur trade attracted the first European settlers to the area as early as 1818, it never became a major player in the fur trade. Soon after 1830, much of the trade moved west, as there had been over-trapping in the region. The establishment and growth of the lumber industry in the area spurred development of Oshkosh. Already designated as the county seat, Oshkosh was incorporated as a city in 1853. It had a population of nearly 2,800. The lumber industry became well established as businessmen took advantage of navigable waterways to provide access to both markets and northern pineries. The 1859 arrival of rail transportation expanded the industry's ability to meet the demands of a rapidly growing construction market. At one time, Oshkosh was known as the "Sawdust Capital of the World" due to the number of lumber mills in the city, 11 by 1860. During the Civil War, the 21st Regiment, Wisconsin Infantry, of the Union Wisconsin Volunteers was organized at Oshkosh, taking in many new recruits. This was one of two units organized in the state; the other was the 6th Regiment, Wisconsin Infantry, organized at Camp Randall, Madison. The 21st mustered in September 5, 1862, marching to Ohio and Louisville, Kentucky, where it participated in the fortification of Louisville later that year. It was attached to the Army of the Ohio and later to the Army of the Cumberland. By 1870, Oshkosh had become the third-largest city in Wisconsin, with a population of more than 12,000. The community attracted a range of professional teachers, attorneys, doctors, businessmen, and others who helped it flourish. The Oshkosh Daily Northwestern newspaper (now the Oshkosh Northwestern) was founded around this time, as was the Oshkosh State Normal School (now the University of Wisconsin Oshkosh). Lumber continued as the mainstay of the city. By 1874, it had 47 sawmills and 15 shingle mills. On April 28, 1875, Oshkosh had a "Great Fire" that consumed homes and businesses along Main Street north of the Fox River. The fire engulfed 70 stores, 40 factories, and 500 homes, costing nearly $2.5 million (or $51.2 million in 2010 money) in damage. Around 1900 Oshkosh was home of the Oshkosh Brewing Company, which coined the marketing slogan "By Gosh It's Good." Its Chief Oshkosh brand became a nationally distributed beer. The Oshkosh All-Stars played in the National Basketball League from 1937–49, before the NBL and the Basketball Association of America merged to become the NBA. Oshkosh reached the NBL's championship finals five times. The city has a total of 33 listings on the National Register of Historic Places. Some area entrepreneurs and businessmen made their fortunes in the lumber industry. Many made significant contributions to the community, in both politics and supporting philanthropic organizations. Following devastating fires in the mid-1870s, new buildings were commissioned in Oshkosh that expressed a range of good design: for residential, commercial, civic and religious use. The many structures which make up the city's historic areas are largely a result of the capital and materials generated by the lumber and associated wood manufacturing industries. Oshkosh had six historic districts as of October 2011. 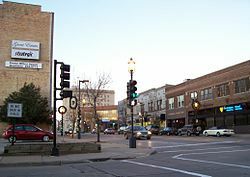 They include the Algoma Boulevard, Irving/Church, North Main Street, Oshkosh State Normal School on the University of Wisconsin–Oshkosh campus, Paine Lumber Company, and Washington Avenue historic districts. The city had 27 historic buildings and sites individually listed on the NRHP as of October 2011. Eleven are houses, four are churches, and the remainder include schools, colleges, a bank, a fire house, an observatory, the county courthouse, and a cemetery where many of the entrepreneurs are buried. Oshkosh is located at 44°1′29″N 88°33′4″W﻿ / ﻿44.02472°N 88.55111°W﻿ / 44.02472; -88.55111 (44.024983, -88.551336). According to the United States Census Bureau, the city has a total area of 26.61 square miles (68.92 km2), of which, 25.59 square miles (66.28 km2) is land and 1.02 square miles (2.64 km2) is water. Oshkosh has a humid continental climate (Dfa) according to the Köppen climate classification system. As of the census of 2010, there were 66,083 people, 26,138 households, and 13,836 families residing in the city. The population density was 2,582.4 inhabitants per square mile (997.1/km2). There were 28,179 housing units at an average density of 1,101.2 per square mile (425.2/km2). The racial makeup of the city was 90.5% White, 3.1% African American, 0.8% Native American, 3.2% Asian, 0.7% from other races, and 1.7% from two or more races. Hispanic or Latino of any race were 2.7% of the population. There were 26,138 households of which 25.7% had children under the age of 18 living with them, 38.7% were married couples living together, 10.0% had a female householder with no husband present, 4.3% had a male householder with no wife present, and 47.1% were non-families. 34.4% of all households were made up of individuals and 11.4% had someone living alone who was 65 years of age or older. The average household size was 2.24 and the average family size was 2.90. The median age in the city was 33.5 years. 18.6% of residents were under the age of 18; 18.7% were between the ages of 18 and 24; 26.7% were from 25 to 44; 23% were from 45 to 64; and 12.9% were 65 years of age or older. The gender makeup of the city was 51.2% male and 48.8% female. As of the census of 2000, there were 62,916 people, 24,082 households, and 13,654 families residing in the city. The population density was 2,662.2 people per square mile (1,028.0/km²). There were 25,420 housing units at an average density of 1,075.6 per square mile (415.3/km²). The racial makeup of the city was 92.73% White, 2.19% Black or African American, 0.52% Native American, 3.03% Asian, 0.03% Pacific Islander, 0.53% from other races, and 0.98% from two or more races. 1.69% of the population were Hispanic or Latino of any race. 52.2% were of German and 6.3% Irish ancestry according to Census 2000. In the city, the population was spread out with 20.7% under the age of 18, 18.1% from 18 to 24, 29.7% from 25 to 44, 18.3% from 45 to 64, and 13.1% who were 65 years of age or older. The median age was 32 years. For every 100 females, there were 99.9 males. For every 100 females age 18 and over, there were 98.7 males. WIS 26/Hwy N Waupun Rd. (Exit 113), WIS 44/91 South Park Ave./Ripon Rd. (Exit 116), 9th Ave. (Exit 117), WIS 21 Oshkosh Ave./Omro Rd. (Exit 119), US 45 Algoma Blvd. (Exit 120), and WIS 76 Jackson St. (Exit 124). U.S. Route 41 US 41 is cosigned with Interstate 41 in the Oshkosh area. WIS 21 travels west to Omro, Wautoma and Tomah, Wisconsin. WIS 21 is partly or entirely along Omro Rd., Oshkosh Ave., Congress Ave., and Algoma Blvd. WIS 26 Southbound, routes to Rosendale, Waupun, Beaver Dam, Watertown, Ft. Atkinson, and Janesville, Wisconsin. This is Waupun Rd. WIS 44 travels southwest to Ripon, Wisconsin. WIS 44 is partly or entirely along Ripon Rd., South Park Ave., Ohio St., Wisconsin St., and Irving Ave.
U.S. Route 45 travels north to New London, Wisconsin and travels south to Fond du Lac along Lake Winnebago. US 45 is partly or entirely along Fond du Lac Rd., Main St., Algoma Blvd. (Northbound) / High Ave. (Southbound), Jackson St., Murdock St., and Algoma Blvd. WIS 76 travels north to Shiocton, Wisconsin. This is Jackson St. from US 45 Murdock St heading north. WIS 91 travels west to Berlin, Wisconsin. This is cosigned with WIS 44 along South Park Ave west of US 41 to Waukau Rd. Then it continues west on Waukau Rd. Oshkosh is also served by the GO Transit (formerly Oshkosh Transit System), which runs nine fixed-route bus routes throughout the city from 6:15 AM until 6:15 PM Monday through Saturday. One of these routes also connects Oshkosh with Neenah, Wisconsin and the Fox Cities' transit system, Valley Transit. Oshkosh's airport, Wittman Field or Wittman Regional Airport (KOSH), opened in 1927 as Oshkosh Airport Inc. The airport had commercial traffic starting in 1928 when Northwest Airways delivered mail to Oshkosh and the Fox Cities. In 1972, the airport was renamed after race pilot Steve Wittman, who was the airport manager for 38 years. Wittman Field had commercial service on a number of airlines until 2003. Wittman was served at various times by Wisconsin Central Airlines, North Central, Republic, Air Wisconsin, American Central, Midstate Airlines, Northwest Airlink, United Express, Midway Connection, Skyway, and Great Lakes. Service on the final carrier, Great Lakes, was terminated in 2003 following the FAA's termination of a federal subsidy. In the 21st century, Wittman Field continues to host the AirVenture Air Show and Expo (formerly the EAA up to 1998). The EAA was founded in 1953 in Milwaukee, Wisconsin by Paul Poberezny. The event was first held at Timmerman Field. In 1959, it was moved to Rockford, Illinois. By 1969, the EAA had grown too big for Rockford Municipal Airport, and the convention voted on moving to Oshkosh. During the Airshow, Wittman Regional Airport becomes the busiest airport in the world: more than 500,000 people and 10,000 airplanes attend AirVenture each year. The closest airport with commercial service is Appleton International Airport in Appleton, Wisconsin. Oshkosh Correctional Institution, a Wisconsin Department of Corrections prison, is located in Oshkosh. Oshkosh is represented by Glenn Grothman (R) in the United States House of Representatives, and by Ron Johnson (R) and Tammy Baldwin (D) in the United States Senate. Rick Gudex (R) represents Oshkosh in the Wisconsin State Senate, and Michael Schraa (R) and Gordon Hintz (D) represent Oshkosh in the Wisconsin State Assembly. Oshkosh Corporation is headquartered in Oshkosh. Oshkosh Corporation, formerly Oshkosh Truck, is the leading manufacturer and marketer of specialty vehicles and bodies in four primary business groups: Access Equipment, Defense, Fire & Emergency, and Commercial. Plastic packaging is also a major industry, with Bemis as a major employer. There are two well known chocolate companies located in Oshkosh, Hughes and Oaks. Oshkosh is known for OshKosh B'Gosh, a manufacturer of overalls and children's clothing founded in the city in 1895. Originally a small-town manufacturer of adult work clothing, it became best known for its children's lines. The original children's overalls, dating from the early twentieth century, were intended to help children dress like their fathers. According to the company, sales increased dramatically when Miles Kimball, an Oshkosh-based mail-order catalog, featured a pair of the overalls in its national catalog. As a result, OshKosh B'Gosh began to sell their products through department stores and expanded their children's line. Their office is now based in Atlanta, Georgia. Oshkosh is the home of EAA AirVenture Oshkosh, "The World's Greatest Aviation Celebration" held by the Experimental Aircraft Association, Inc. ("EAA"). AirVenture is the world's largest airshow. During AirVenture, air traffic at Wittman Regional Airport exceeds that of any other airport in the world. EAA is a non-profit member organization, dedicated to home-built aircraft, restored aircraft, and light-sport aircraft, and fostering an interest in flying in children 8–18 years old through its Young Eagles program. Tourism and events are part of the local economy. Recreational fishing and boating on Lake Winnebago includes many active fishing tournaments, an annual sturgeon spearing season, and frequent yacht and boat races. Music festivals include the summer-long WaterFest downtown and major summer music festivals for country, Christian, and rock music. Oshkosh is also home to two regional hospitals and the Winnebago Mental Health Institute located in nearby Winnebago, Wisconsin. Oshkosh has 14 public elementary schools, five public middle schools, and two high schools operated by the Oshkosh Area School District. The high schools in the Oshkosh Area School District are Oshkosh North High School and Oshkosh West High School. Private schools in the city include Grace Lutheran School (pre-K to 8th grade) and Martin Luther School (pre-K to 8th grade) of the WELS, Lourdes High School, and Valley Christian High School. The University of Wisconsin–Oshkosh, the third-largest university in the state, is located in Oshkosh. The downtown campus serves approximately 14,000 students and employs 1,700 staff. Higher education is also served by a campus of the Fox Valley Technical College. Oshkosh has seen a recent (as of 2006) resurgence in its cultural and entertainment options. A downtown redevelopment plan led to the construction of the outdoor Leach Amphitheater on the Fox River. It hosts the weekly Waterfest concert series during the summer, as well as national touring musical acts and local community events. Also in downtown Oshkosh is the Grand Opera House, a performing arts center. Downtown Oshkosh has a Farmers Markets on Saturdays in the summer. The Downtown Oshkosh Gallery Walk, held every first Saturday of the month year-round, surged in attendance through the warmer months of 2006. A number of downtown Oshkosh music venues have opened, and existing venues have tended to expand their schedules, following the trend of the area at large. The Jambalaya Art Cooperative and Art Space Collective have been long standing anchors of the Gallery Walk. In 2010, Chicago Magazine said The Jambalaya Cooperative, 413 N. Main St., was a "must see" destination when visiting Oshkosh. Long-running community festivals, such as Sawdust Days in Menominee Park, continue to be popular. 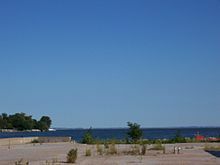 Menominee Park is also the site of the Menominee Park Zoo and "Little Oshkosh", a community-built playground. "Country USA" is an annual five-day festival in June that features entertainment from dozens of country music acts. "Rock USA" features many rock music acts as well. The Milwaukee Bucks NBA basketball team placed their development team, the Wisconsin Herd, in Oshkosh beginning with the 2017–18 season. The team plays basketball at Menominee Nation Arena. The southern terminus of the Wiouwash State Trail. ^ a b "American FactFinder". United States Census Bureau. Archived from the original on 2012-02-17. Retrieved 2012-11-18. ^ "Ojibwe Dictionary". Freelang. Archived from the original on 2012-09-19. Retrieved 2007-03-28. ^ "Destruction by Fire. ; Further Particulars of the Burning of Oshkosh, Wis". The New York Times. May 1, 1875. Retrieved April 29, 2018. ^ "OSHKOSH, WI (476330)". Western Regional Climate Center. Archived from the original on December 8, 2015. Retrieved December 4, 2015. ^ "OSHKOSH, WISCONSIN Period of Record General Climate Summary - Temperature". Western Regional Climate Center. ^ "HOME IN OSHKOSH". Archived from the original on 12 May 2016. Retrieved 24 April 2016. ^ "Oshkosh Waterfest 33". waterfest.org. Retrieved April 29, 2018. ^ "Sawdust Days Coming Soon!". www.sawdustdays.com. Retrieved April 29, 2018. ^ "Bucks to own D-League franchise in Oshkosh". Milwaukee Journal Sentinel. Retrieved February 7, 2017. Wikimedia Commons has media related to Oshkosh, Wisconsin. "Oshkosh, Wis." . The New Student's Reference Work . 1914.